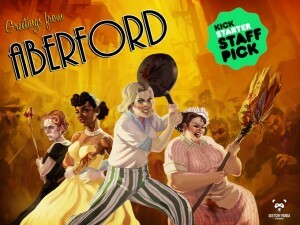 Aberford is a video game that is currently on Kickstarter. At the time I am writing this blog, it has 26 days to go. Aberford takes place in the 1950’s and all of the player characters are female. The game was created by Sketchy Panda Games. Aberford is described as a graphic adventure game with brawler-style combat. Personally, I like video games give players a lot of zombies to fight against. It’s awesome that all of the player characters are female. I can’t think of any other video game like that. Almost all of the player characters are post-WII suburban housewives who live in the town of Aberford. (One character is a teenager, and another is unmarried). So, what we have in this game is a wealth of diverse female characters who are ready and willing to fight and kill zombies. The player characters you see in the video are Peggy and Betty. Peggy is a professional girl’s-baseball-player-turned-unhappy-housewife. Betty is a former Army nurse who is “the master of everything a 50’s housewife should be”. Other characters, who are not shown in the video, include Doris, who worked as a riveter and lost her job after the war ended. Sylvia is a former scientist (and mother of two children). Sketchy Panda Games also has some expansion characters These characters play important roles in the main story and are playable in freeplay/multiplayer mode. Some of the stretch goals for the Kickstarter involve the creation of full side campaigns for the expansion characters. There are four expansion characters. Norma is the manager of Ms. Butler’s Boarding House for Girls and Young Women. She fought in WWII before transitioning and is taking experimental anti-androgen. Mary is a third-generation Japanese-American who spent her teenage years in a wartime internment camp. Mary is not married. Sixteen-year-old Patricia is a cheerleader and the daughter of Doris. Alejandra, who speaks very little English, fell in love with a Mormon missionary in Mexico and married him after she completed her degree in mathematics. This couple has just moved in to Aberford.